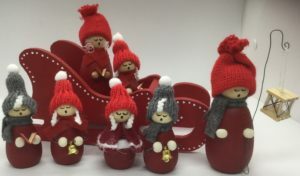 Home / STORE / Nisse / Nisse Caroler Male. 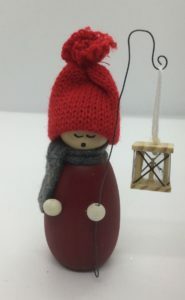 wooly hat and holding a lantern on a shepherds crook, sweetly singing spreading joy and goodwill to all. He has a wooden body painted red with a grey woolen scarf and red woolen hat. He has wood bead hands. The shepherds crook is made from thin wire and the lantern from wood. Buy the family to make a charming choir.